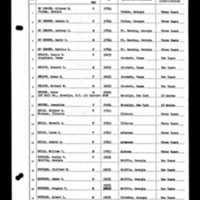 The outward-bound passenger list of the USNS Henry Gibbins, which was a transport ship active in the Korean War. The document lists the passenger's family name, United States passport number, place of birth, date and place of naturalization, the length of time the passenger intended to remain aboard and the country of destination. A notable individual listed in this record is Albert Lee Minyard Jr. (1917-1986). Born in Brooks, Georgia, Minyard served in the United States Army from 1935-1941 and from 1948 to 1958. In December of 1948, he married his wife, Roslyn Minyard, and eventually had two boys with her. The family moved to Hillsborough County, Florida, where Alberty passed away on January 13, 1986. He is memorialized in Florida National Cemetery in Bushnell, Florida. Roslyn survived him, living in the Tampa and St. Petersburg area until her own death on May 2, 2000. She is memorialized with Albert in Bushnell. 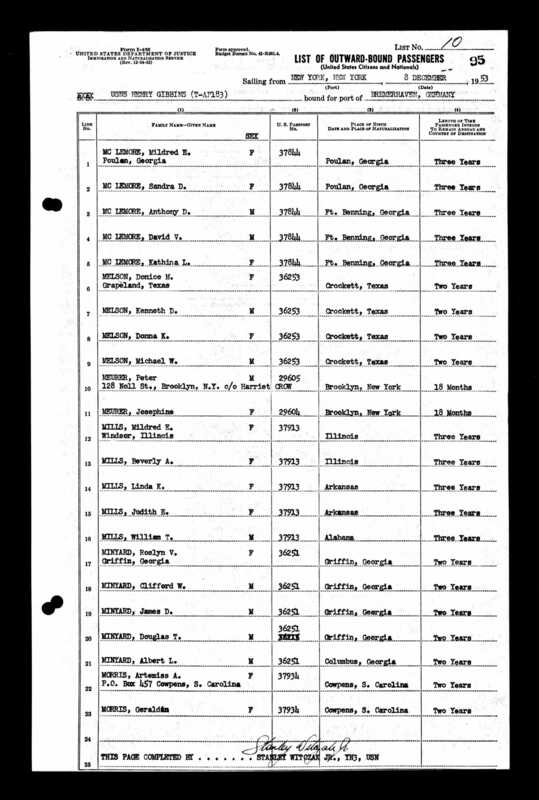 Digital reproduction of original passenger list. Originally created and published by the United States Department of Justice, Immigration and Naturalization Service. Edwards, Paul M. The Korean War. Westport, Conn: Greenwood Press, 2006. United States Department of Justice, Immigration and Naturalization Service. “List of Outward-Bound Passengers.” RICHES of Central Florida accessed April 19, 2019, https://richesmi.cah.ucf.edu/omeka/items/show/10265.